(g) to balance the present and future interests of all Victorians. Community members and groups are crucial for their local knowledge and expertise which, if listened to, would save the State and public millions of dollars in wasted time and energy considering flawed planning proposals. The Group has taken part in in many planning consultations – see Appendix A. A major motel, retail development and excavation within meters of major caverns on Port Campbell’s fragile limestone headland cliffs. The University of New South Wales Law Journal published a special edition on ‘Rethinking Climate Change and the Law’. 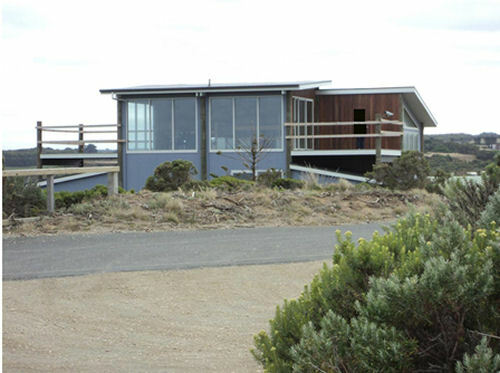 A history of the Port Campbell Southern Ocean Beach House saga is part of this edition. It was launched by the Honourable Justice Brian Preston, Chief Judge of the NSW Land and Environment Court. An important part of the articles is an emphasis on community expertise and involvement in decision-making. See article attached and at: https://www.unswlawjournal.unsw.edu.au/. There was extensive community consultation, but it seems the community was not heard. The proposed projected viewing platform at the 12 Apostles appears to be high risk. It is situated above an area where there has been a major recent cliff collapse – image below. Local knowledge, and geotechnical knowledge, would say this is high risk. This is just one of the problems with the Shipwreck Coast Master Plan, because community expertise has been ignored. We must ask why this proposal was permitted by Council, as the risks are obvious. We must also ask why the proposal received a $650,000 federal government grant; State Government appears to have encouraged Corangamite Shire Council to approve the development. The proposal is an 18 room residential ‘eco’-lodge, 20 cabins elevated on stilts, a restaurant, café, shop, briefing facilities, office, function rooms, 2 swimming pools/day spa, lookout tower, cycling and walking trails, boardwalks, a boat shed and jetty pontoon/boat ramp for pleasure activities. There is an estimated 278 car parks, 5 bus parks, and 480 visitors. Council notes the development will require Crown Land “to create road access and walking tracks”. The flood plain presents an unacceptable risk to the low-lying development, and the development presents an unacceptable risk to a non-resilient, fragile estuary environment which contains endangered and threatened species including Latham’s Snipe, Australasian Bitten, Southern Brown Bandicoot and Australian Grayling. The site adjoins the Great Otway National Park. The Great Ocean Road Region Landscape Assessment Study lists the area as of State significance with a landscape objective: “To protect the valley floor from development” and “Potential Threats: Development on valley floor (unlikely)”, recognising it is unlikely a development would be put on the flood plain. The Victorian Coastal Strategy states to avoid development in low lying areas. Part of the area has an Environmental Significance Overlay “for the protection of watercourses, water bodies, and wetlands”. There are serious concerns regarding the leeching potential of the sewer and waste water system and potential for catastrophe in floods. The submission recognises the likely presence of acid sulphate soil. Ten sites were rezoned on the Corangamite Shire coast for large tourism projects. None of these sites have been developed as yet, and none would have these risks. Decision-makers must take into account the effects of climate change and the precautionary principle: the combined effects of rising seas, storm surge, extreme rainfall events, and flooding. But now the community has withdrawn from VCAT, who is going to make this decision? Council does not have the expertise. 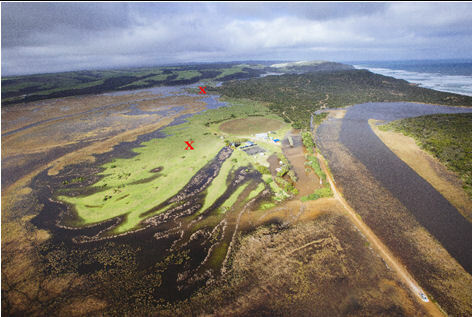 The State government must investigate and insist on an independent Coastal Hazard Vulnerability Assessment and a full and inclusive public Environmental Effects Statement to assess the potential for flooding risk, and risk to the public. Princetown Flood Plain. X marks site of proposed development with road linkages into and between the sites. Note the road into the area is flooded, and this was solely due to storm surge. A more extreme event would occur with a high rainfall event in conjunction with storm surge. The height imposes on the public domain, overlooking a state and nationally significant headland’s walking trail. Any development is required to be a height of the vegetation and fit neighbourhood character. VCAT and Council ignored the community’s concerns and consequently failed to meet planning requirements. 1 Hennessy St does not fit neighbourhood character, nor does it meet the height guides, and it overlooks national and state listed heritage headland and walking trail. View from heritage listed Beacon Steps lookout. The only ones winning at the moment appear to be consultants who may conduct consultation but do not seem to listen to expert community advice. It is costing rate payers and tax payers billions. The latest Corangamite Shire Amendment (C45) 2017 – changes to the MSS – demonstrated that planners do not understand the difference between Objectives and Strategies. Planning was advised by the Panel to rewrite them. The Panel members also noted the amendment could become irrelevant if Smart Planning proceeds. A lot of time and money had been spent on a document which could be irrelevant. Not smart planning. There needs to be a full review of VCAT’s inconsistencies and poor performances in decision-making which undermine the planning process. For the benefit of Victoria there must not be weakened permit or planning triggers or referral requirements, or permit exemptions, or the removal of appeal rights. Without real community input, the government will make many more mistakes which will cost the State billions. 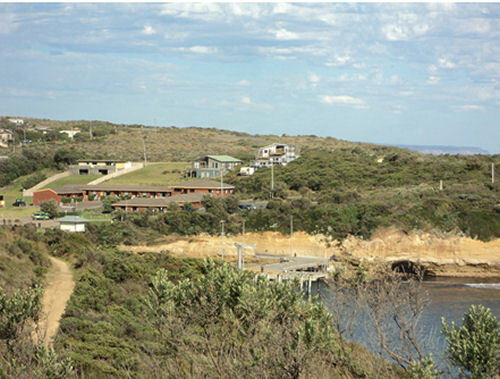 •	Amendment C36 for Heritage Overlay on Port Campbell headland, 2014. (Planning panel recommended this be implemented). •	Drafted the South West Threatened Species Recovery Program which aims to provide a plan of action to recover threatened species in South West Victoria including liaising with Parks Victoria, Landcare, Conservation Ecology Centre Cape Otway and the Otway Community Conservation Network, 2013. •	Co-ordinated the Environment Defenders Office to assist writing and present a submission on Amendment C30 which has resulted in improved environmental outcomes, 2013. •	Corangamite Shire’s Port Campbell and Coast Amendment C29, 2012. •	Marion Manifold. High-risk coastal resort on flood plain. Park Watch. Victorian National Parks Association. September. 2017. •	Marion Manifold. 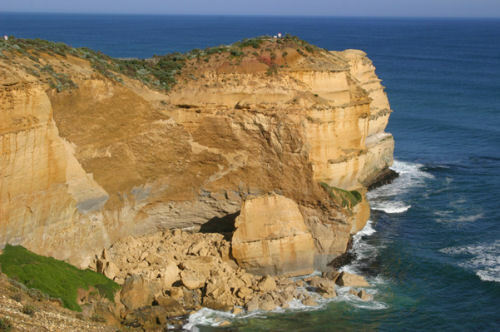 The Port Campbell Coast: Paradise Lost. Park Watch. Victorian National Parks Association. June 2014. Pp.12-13. •	Marion Manifold. Port Campbell: Developments on a Fragile Coast. Park Watch. Victorian National Parks Association. December 2014. Pp.18-19. •	Marion Manifold. Port Campbell headland still at risk. Park Watch. Victorian National Parks Association. September 2009. P.23.